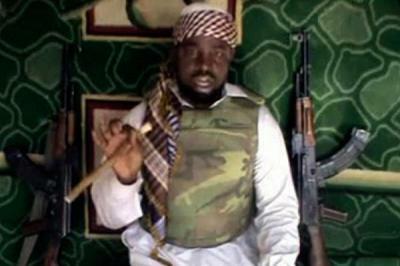 Boko Haram emir Abubakar Shekau, from a propaganda tape. The emir of Boko Haram, the Nigerian terror group that has ties to al Qaeda, has praised the global jihadist organization, and said he and his fighters support jihad in Afghanistan, Pakistan, Kashmir, Chechnya, Iraq, Saudi Arabia, Yemen, Somalia, Algeria, Libya, and Mali. Abubakar Shekau, the leader of Boko Haram, lauds and supports al Qaeda and its affiliates in a videotape that was released yesterday on jihadist forums. Shekau’s speech, which was obtained and translated by the SITE Intelligence Group, was issued in Arabic, which is an indication that he is seeking to appeal to both the wider jihadist community and al Qaeda’s leaders. The 39-minute-long videotape includes numerous clips of Boko Haram fighters in training, as well as video of weapons seized by the group during raids. Shekau warns “Britain, America, Israel, and Nigeria” that the killing of jihadist leaders and imams will not defeat the groups. He also refers to some of al Qaeda’s top leaders who were killed over the past two decades, and notes that “jihad” did not end with their deaths. “We are with our mujahideen brothers in the Cause of Allah everywhere, in Afghanistan, Chechnya, Pakistan, Kashmir, Iraq, the Peninsula of Muhammad [Saudi Arabia], Allah’s peace and prayer be upon him, Yemen, Somalia, Algeria, and other places that I didn’t mention,” Shakau says. Shekau’s videotape is very similar to tapes issued by Shabaab in 2008, when the Somali terror group was making overtures to openly join al Qaeda. 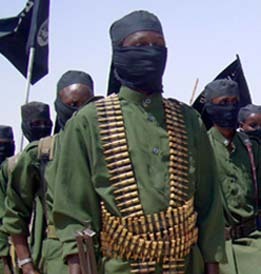 Shabaab officially joined al Qaeda in February 2012, but the two groups had already worked closely for years, and al Qaeda leaders served in Shabaab’s top leadership circles prior to the merger. 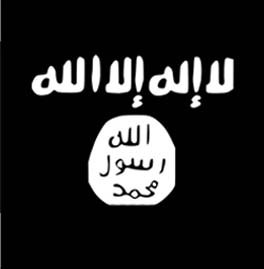 Boko Haram has aimed to become a player in the global jihad. 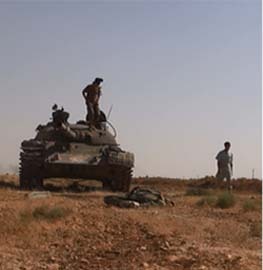 Its fighters are known to fight in Mali with al Qaeda-linked groups, and its members have trained with Shabaab. 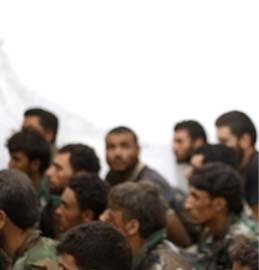 The terror group has also expanded its propaganda efforts to show solidarity with al Qaeda and its affiliates. 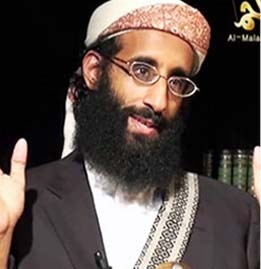 In July 2010, Boko Haram emir Abubakar Shekau issued an online statement praising al Qaeda and offering condolences to al Qaeda of Iraq for its loss of Abu Ayyub al Masri and Abu Omar al Baghdadi. He also threatened the United States. Documents seized at Osama bin Laden’s compound in Abbottabad, Pakistan showed that top-level Boko Haram leaders have been in touch with al Qaeda, according to The Guardian. In addition, Boko Haram is known to receive support from al Qaeda in the Islamic Maghreb and from Shabaab, an al Qaeda affiliate in East Africa. Boko Haram has stepped up its suicide operations in Nigeria. So far this year, Boko Haram has carried out at least 19 suicide attacks [see LWJ report, Boko Haram suicide bombs kill 11 at Nigerian military church]. The targets have included churches, mosques, newspapers, government officials, and security forces. The terror group also conducted several other suicide attacks in previous years, and not all of its attacks have been against local Nigerian targets. Boko Haram’s most high-profile suicide attack targeted the United Nations headquarters in the Nigerian capital of Abuja in August 2011. The US has only just begun to awaken to the threat that Boko Haram poses to the international community. In June, the US added Shekau to its list of global terrorists, along with Khalid al Barnawi and Abubakar Adam Kamba, both of whom have ties to Boko Haram and close links to al Qaeda in the Islamic Maghreb. But the US government has not added Boko Haram to the list of terrorist entities, as some officials fear the designation would only serve to further radicalize the group. Please…I guess anyone with a shoddy AK, a couple of bandanas and a camoflage pajamas on can call themselves Emir these days. *sigh* … quite unfortunate. Disturbing to see the ideaology spreading across the world. 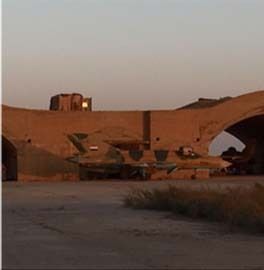 Well it looks like all the drones pulling out of Astan will have a new home in the upper maghreb…good hunting!